We Do Trails - Join Us! "Trails aren't BORN - They're designed and built by volunteers - You and me!" 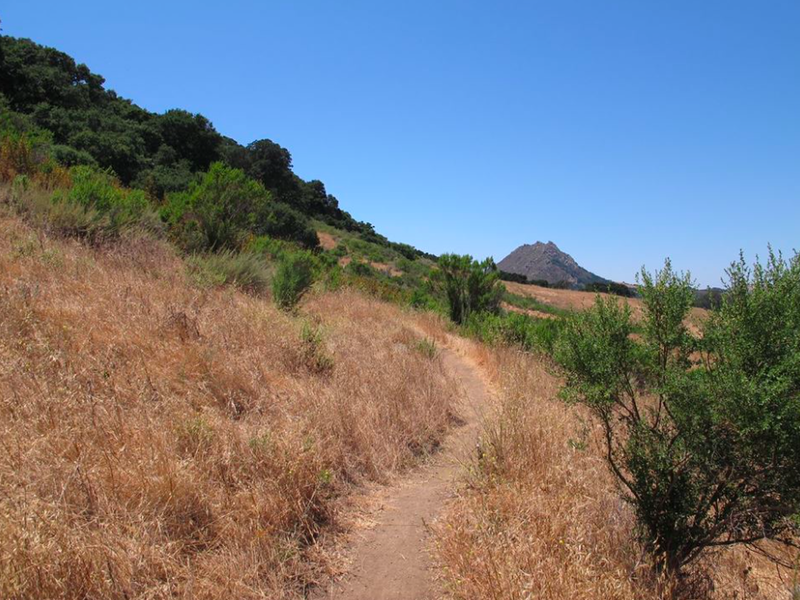 For the next few weeks, the Wednesday work group will be working on the Bishop Peak Trails. 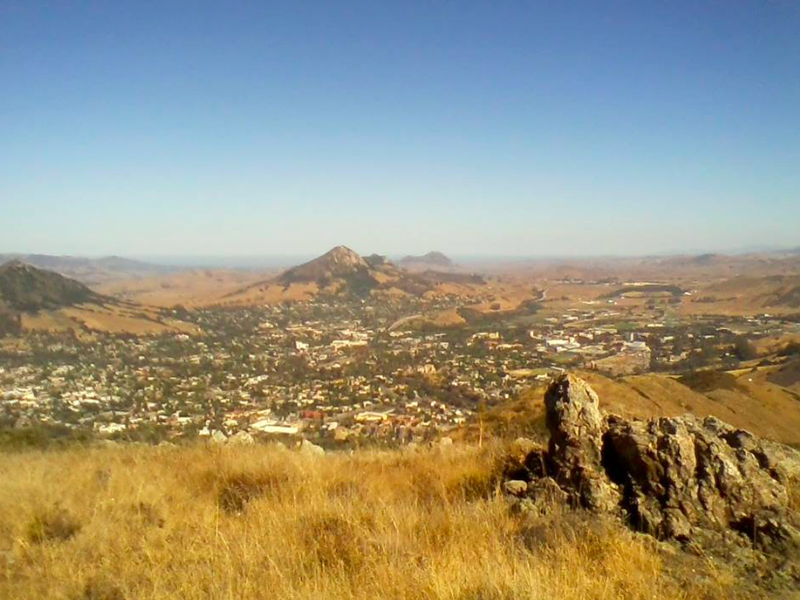 Meet at the Bishop Peak Trailhead on Patricia Drive at 8:35am. Meeting every Wednesday at 8:35 AM. An opportunity for volunteers to gather and work on building new trails in City-owned open space. Contact Ranger Services Supervisor Doug Carscaden for nine information or the location of this weeks meeting place. 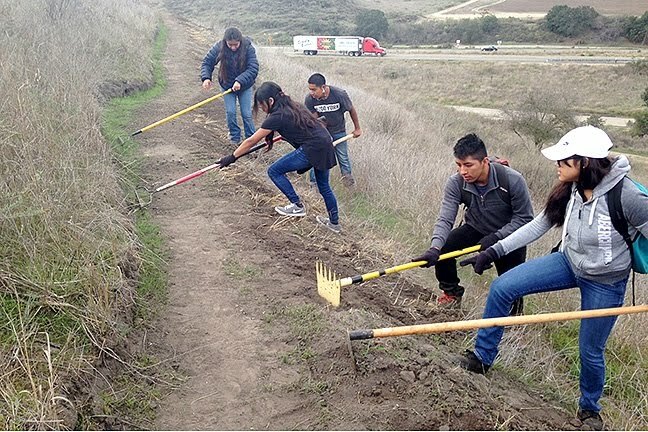 Next Trail Work Day... Pismo Preserve on Sunday, April 15th at 9am to 1pm. Next CCCMB meeting: Tuesday, April 17th, 5:30-7pm, SLO Parks and Rec Office, 1341 Nipomo St., San Luis Obispo. Public is welcome! We had 25 workers out at the Pismo Preserve. We cleared a lot of trail and completed a couple trail improvement projects. 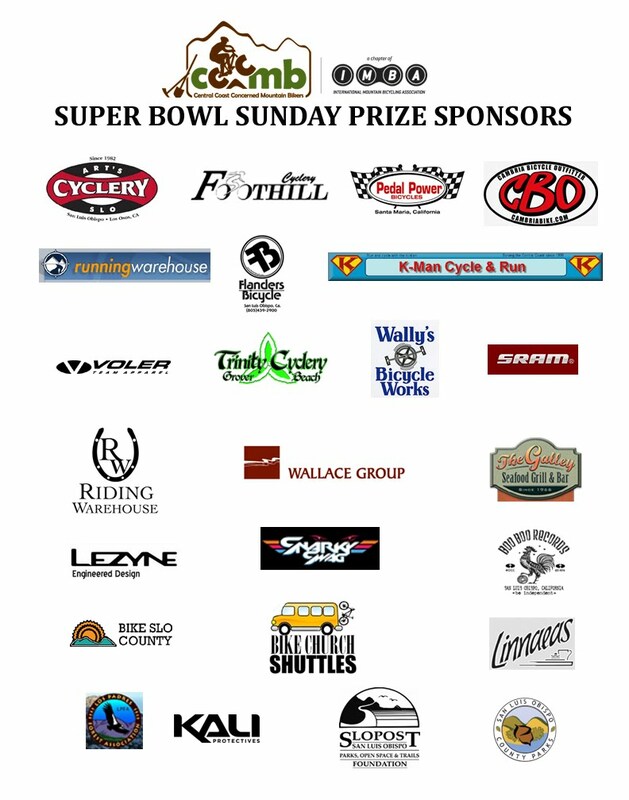 Thanks to our raffle sponsors Wally's Bike Shop, Running Warehouse, and Voler Cycling Apparel. Also thanks to House of Breads for the baked goods. We're excited to announce that CCCMB has been chosen as a recipient of International Mountain Bicycling Association's new national fundraising "Dig In" campaign! Donations will be used for our new bike park and trail system at El Chorro Regional Park. There will be a beginner/intermediate skills area, pump track, and flow trails along with a larger area for expansion that could include challenging skill development features such as logs, ramps, boulders, and narrow boardwalks. IMBA Trail Solutions has completed an initial site visit and is developing a conceptual design report to be shared with members when completed. Although this project will be getting some support from IMBA and the bicycle industry, we are also asking for local donations to help create our dream bike park that will one day become a premier mountain bike destination on the central coast. The Vormbaum family was the winner of this year's CCCMB membership raffle! The bike, a Specialized 2016 Camber Comp 27.5. The Vormbaum family, along with CCCMB would like to thank Pedal Power of Santa Maria for this donation and their long history of support! 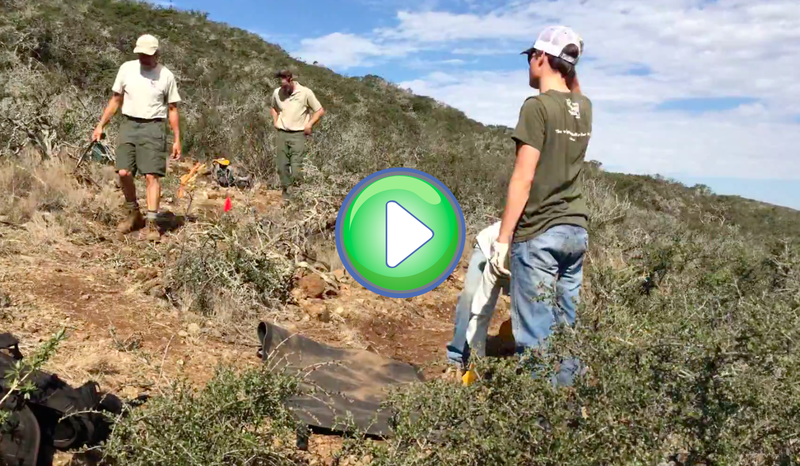 143 Volunteers in 19 different crews spread out across Montaña de Oro on Super Bowl Sunday to repair multi-use trails throughout the park. This was the 31st annual trail event by CCCMB on Super Bowl Sunday and by far the warmest. 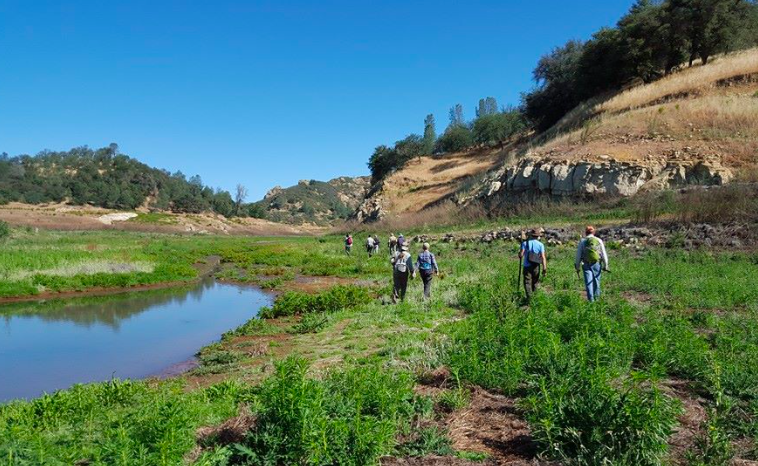 Our next trail workday is Sunday Dec 17th at Santa Margarita Lake. Meet us at the White Oaks Day Use Area at 8:30am. The staff at the entrance kiosk can provide directions if you tell them you are there for trail work (your entrance fee will also be waived.) Lunch after trailwork is included!! Be sure to bring the usual water, snack, long sleeves and long pants, sturdy shoes and hat/sunscreen. Tools will be provided. Everyone is welcome! Thank you to all volunteers who made it out for CCCMB's Fernandez Trailwork day last Sunday, December 3rd. 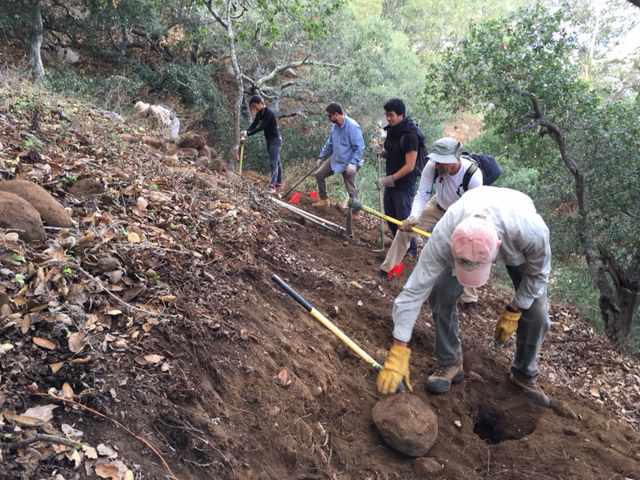 Ten volunteers worked hard cutting brush in an attempt to keep Fernandez trail open and ride-able. They got a lot done but the trail is still overgrown in spots and CCCMB will definitely need some help hitting it again in 2018. Four volunteers won gift cards from K-Man Cyclery, Voler, The Galley, and Foothill Cyclery - we'd like to extend a huge thanks to K-Man, Voler, The Galley, Foothill Cyclery, and the rest of our sponsors! We're excited to announce that CCCMB has been chosen as a recipient of International Mountain Bicycling Association's new national fundraising "Dig In" campaign! Donations will be used for our new bike park and trail system at El Chorro Regional Park. There will be a beginner/intermediate skills area, pump track, and flow trails along with a larger area for expansion that could include challenging skill development features such as logs, ramps, boulders, and narrow boardwalks. Anyone & Everyone is welcome! Come out and enjoy a weekend of camping and optional trail work this weekend at Lopez Lake. We will be camping in the reserved group camping area and will pretty much have the area to ourselves. 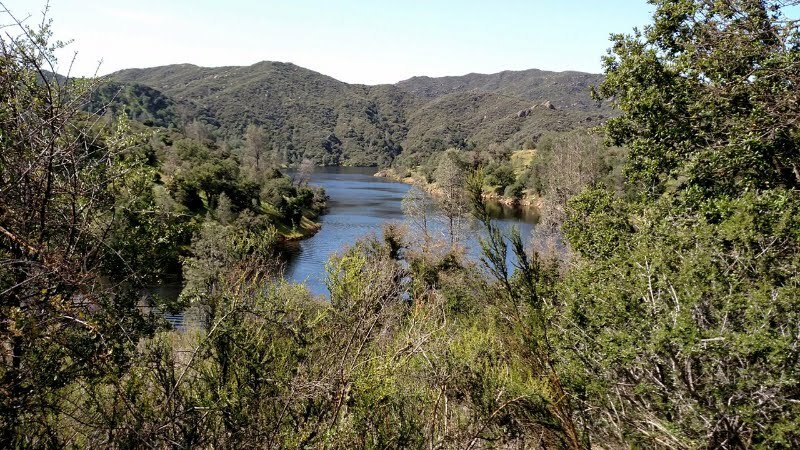 This is a great location to stage from for riding the trails at Lopez Lake and then hanging out afterwards for food and drinks: the trails start about 200 yards away from the camping area. If you camp with us in the group area, camping and entrance to the park is free. The format is informal - we don't have a specific group ride planned, but people will be riding as they wish during the afternoon and evening. As we are camping, night riding is allowed on this occasion. Same regarding food - it will likely be informal potluck style. Also, there are showers located on-site, so you can easily rinse off any poison oak you brushed up against on the ride. Anyone and everyone are welcome, just please RSVP at info@cccmb.org so we have some idea of how many folks are going to show up. Sunday morning we will be doing some optional trailwork on the trails starting at 9AM. If you haven't been before, it's really a great time to do some riding and then hang out with your fellow mountain bikers and trails folks. CCCMB is presenting a great training opportunity for anyone interested!!! Learn more about the latest trail building techniques and ideas from a true professional! This opportunity won't come around again for at least two years! It's local and specific to our trails. Sign up now!! CCCMB is hosting an introductory class in sustainable trail building techniques including design for a quality trail experience. The goal of the workshop is to teach participants how to create outcome-focused trails: providing a targeted experience for riders of varying skill levels while using techniques and concepts of sustainable trails. This course will be presented by Drew Perkins, board member of Mountain Bikers of Santa Cruz. Drew is a professional trail builder with a wide range of experience. He designed and built the new Demo Forest "Flow Trail" in Santa Cruz; he was the trail builder for the Pismo Preserve trail system, for trails in Anchorage Alaska and for several private trails. Drew has helped design and build pump tracks and jump parks in Santa Cruz, and most recently Drew spent two months in Austria helping design and build a new trail at a ski resort. Drew is an expert rider who has experience creating a range of trails from bike specific to multi-use. His instruction combines his wealth of knowledge and experience into an engaging presentation and field exercises. Each field exercise will be about four hours. Lunch will be provided. Cost of the course is $100. The class is limited to 24 people. Please reserve your spot by October 27th. Scholarships are available upon request. CCCMB will hold a trail work day to make improvements at the Bike Skills Area in "The Eucs" off Cuesta Grade. Work will include adding pavers to one of the Jail Break turns and clean up around the tool shed area. Meet at The Eucs by driving to the end of Stenner Creek Rd. in San Luis Obispo (meet there at 9am to hike/ride up to the Eucs). The Eucs can also be accessed from the top of TV Tower Rd. off Cuesta Grade. Bike or hike down the Shooters Trail to The Eucs. 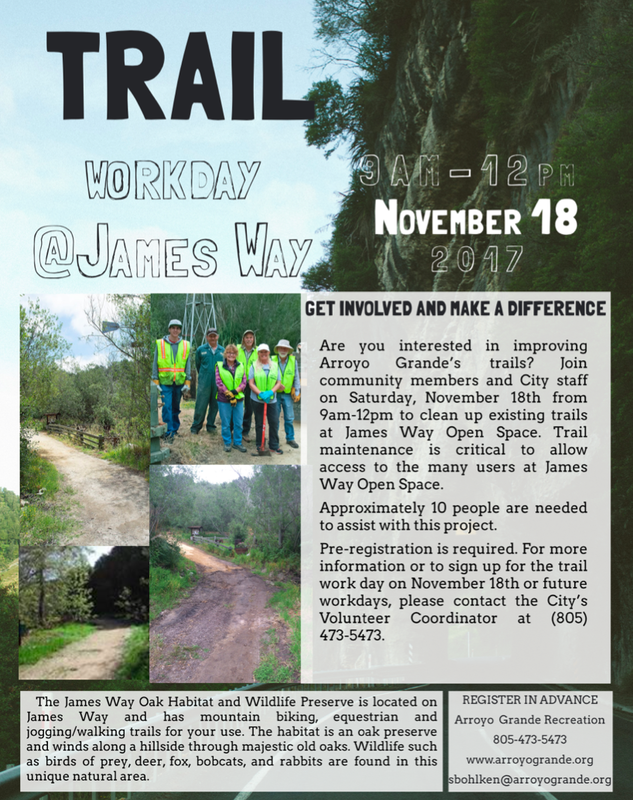 This trail improvement workday is open to the public, so invite your friends to join in. Be sure to wear long sleeves, long pants and bring gloves, hat, sturdy shoes and bring snacks and water. Tools will be provided. Want to order a CCCMB Jersey? Follow this link. CCCMB receives 15% of proceeds from your oder so support CCCMB by spreading the word about making great trails and support your trail makers at the same time. There are several styles and sizes to choose from in both mens, womens and youth. Link to order your CCCMB Jerseys here! Volunteers will meet at the highway 101 entrance. Take 101 south about three miles south of Clark Ave. Exit 161, go left under the overpass and right to the Los Flores Ranch entrance. If you can't make the work day and still want to help Dan Ardoin will be going out there almost every day until the project is finished. Just let him know you are interested. Volunteers are needed on Saturday to help with the clearing weeds, shaping features, and general cleanup. We will also be building a helmet box, so bring your tools and weed eaters and join the other volunteers this Saturday to help maintain YOUR park. The "M" trail is 99% complete and can be traversed by hikers and cyclists as this is a multi-use trail. Cyclists may have to walk their bikes in a few sections. Cyclists and hikers should also be aware that there is some rough terrain and steep drops along the trail. 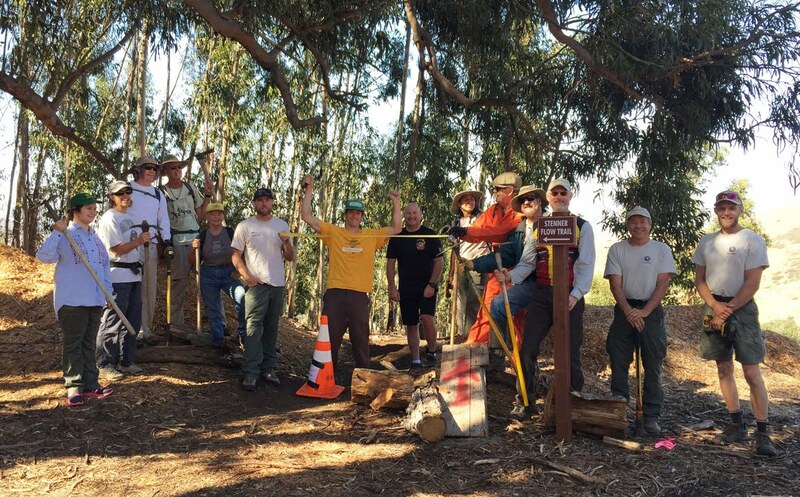 This trail was constructed by members of CCCMB, and many hiker volunteers in cooperation with the City of San Luis Obispo, Parks and Recreation. During the past eight months the mix of workers has been approximately 60% hikers/runners and 40% cyclists. There has been a good many volunteers who are all working together for a common goal of building and maintaining trails in the City of SLO. 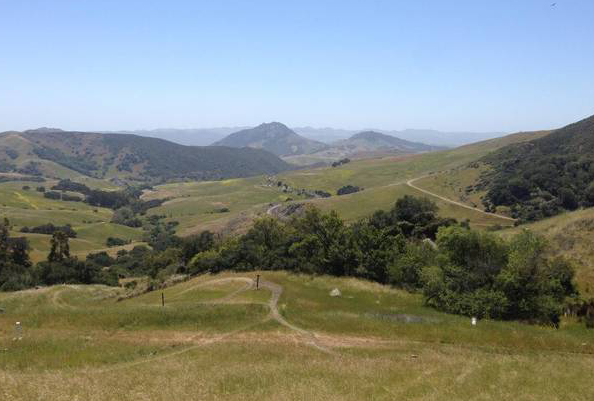 San Luis Mountain is a multi-use trail system with a mixture of public and private trails that is enjoyed by all. 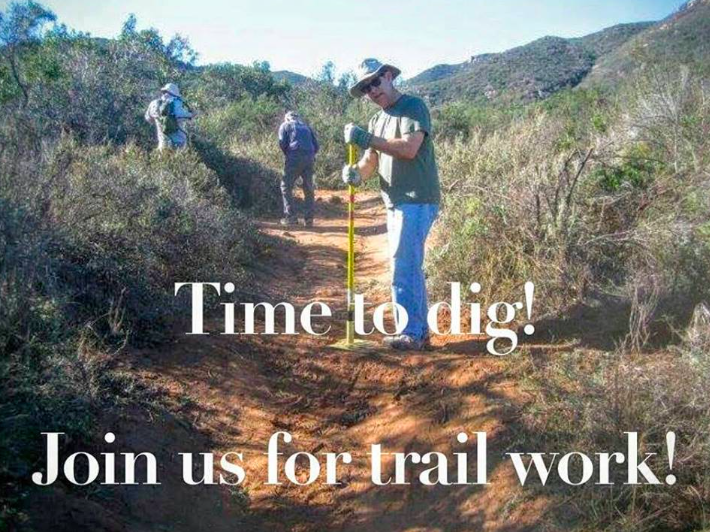 Join the Volunteers: During the next few weeks they will be continuing work around the Lemon Grove Loop installing some new rollover ramps working on some reroutes, rutted sections of trail, and hauling out tools and equipment. If you'd like to help out, meet next Wednesday at the Hill Street Entrance to San Luis Mountain at 8:30am to join the volunteers. Attention Dads, Grads, and all other trail users! Bring your friends and join us at MdO on Sunday, June 18th, to help get our trails in top shape for the summer! Extreme winter weather has left us with extreme springtime brush growth. If you’ve been on the trails, you know it’s time to tackle the issue of clearing branches and brush. Come join us for the morning to reclaim our overgrown trails. We have several locations that need attention so the more people that show up, the more areas we can cover. Tell your friends! Bring your friends! Meet us at Spooner’s Cove Ranch House by 9 a.m. Wear long pants, long sleeves, sturdy footwear, and bring gloves, water and snacks. Tools and guidance will be provided. 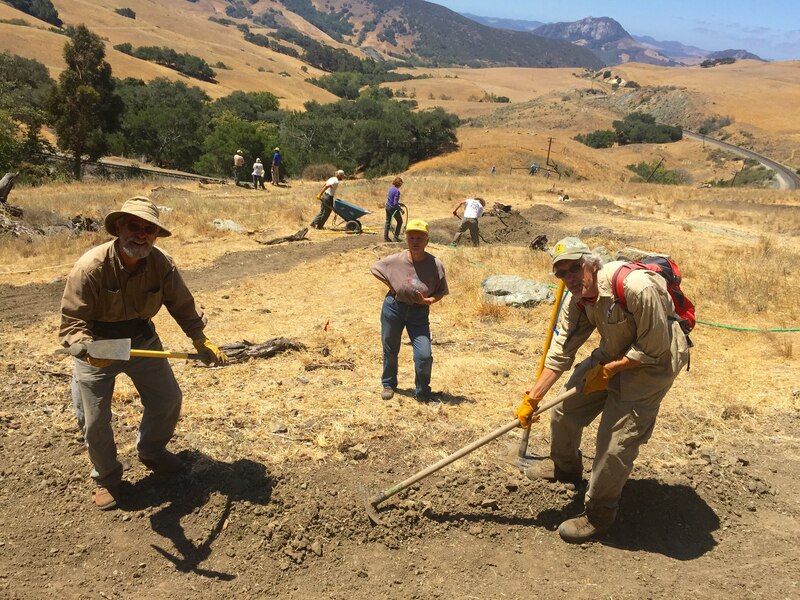 Come join us to work on the Fernandez Trail (near Pozo), on Saturday, June 3rd from 9:00am to approx. 1pm. Directions: From Santa Margarita, take Hwy 58. About a mile outside of town, the road turns into Pozo Rd. Continue on Pozo Rd. for 27 miles to the Pozo Saloon. Continue driving another mile PAST the Pozo Saloon and the road turns into Park Hill Rd. Another 3 miles beyond this intersections you will come to Turkey Flats. Bring: Wear appropriate clothing (long pants, long sleeves, sturdy shoes), and bring a hat, gloves and water. Tools will be provided. Action Is Needed Now to Make This Happen! The Advisory Committee (which Greg Bettencourt, CCCMB, participated in) has created a vision plan for El Chorro Park which will be considered by the Board of Supervisors on Tuesday, June 6th. The possibility of a trailhead for access into the National Forest. Equestrian accommodations after the National Forest access trail. It also includes many other improvements to make it more attractive to a broad range of County residents (electric go-carts, event venue, more camping, bocci ball, disc golf, etc.). What the Advisory Committee came up with is officially a “Programming Plan” which means it is a concept plan. It is NOT a plan that exactly locates some feature or another. I tried to send you the pdf of the Plan (to show what the layout looks like) but the file was too large. The plan is located on the County website HERE. Good news! There has been broad support for these improvements (including trails and bike park) from County staff and the Parks and Recreation Commission. However it is important that the Board of Supervisors hear support for this plan by the trails community next Tuesday. Please make time to either show up at the meeting next Tuesday, June 6th at 1:30 or to email the Board of Supervisors indicating your support (Sunday at the latest) at boardofsups@co.slo.ca.us. That is what needs to happen. Here is the link to the agenda AND the entire "Program Plan”. WHAT: Community submitted videos of mountain bikers riding on local trails will be viewed on a big screen at the Octagon Barn while we enjoy appetizers and refreshments. 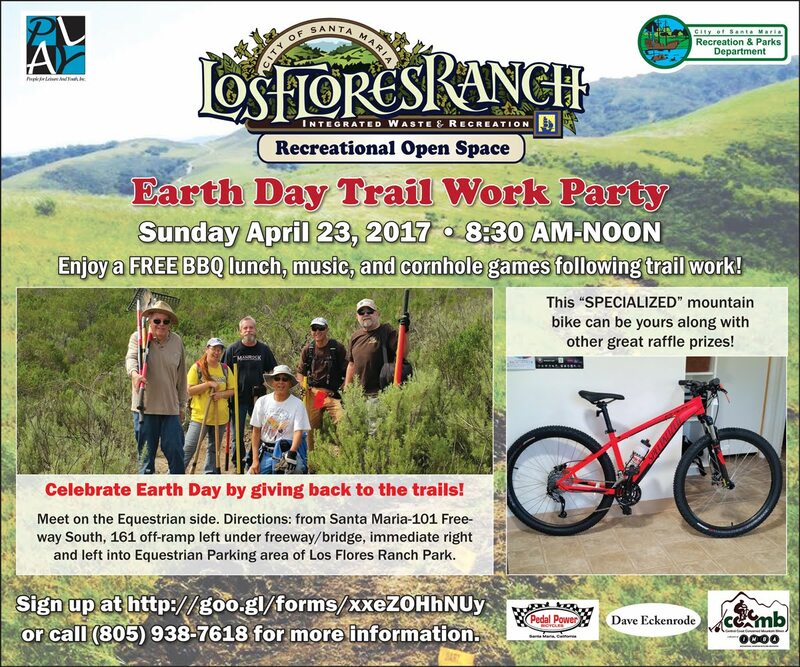 A raffle will be held to raise money for building more trails in San Luis Obispo County with prizes and giveaways from local sponsors. We will also discuss some new opportunities for new trails, updating a county park, and how you can influence local trail design. WHY: This event will be fun, but only with your participation. The same can be said for our local mountain bike trails. We want our local community of mountain bikers to engage with the process of building legal trails. We are stronger when we stand as one and we can work towards building a truly amazing trail network, but only with your help. Post your best video of you and your friends riding on local trails to YouTube or Vimeo and submit the link to contest@cccmb.org by May 17th. Videos must be on legal mountain bike trails in San Luis Obispo County and should be no longer than 5 minutes. The top 3 videos will be awarded prizes and viewed during our "Feature Presentation" while runner up videos will be shown during other portions of the event. Proceeds will go to CCCMB and The Land Conservancy with the goal of building more trails on the Central Coast. 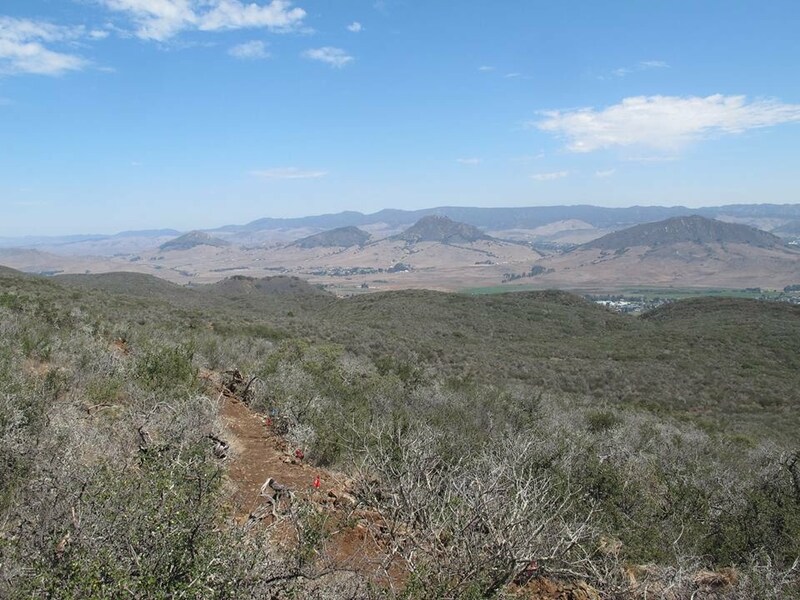 ABOUT US: The mission of Central Coast Concerned Mountain Bikers (CCCMB) is to expand the network of sustainable and enjoyable trails in SLO County and to maintain the trails currently in use. 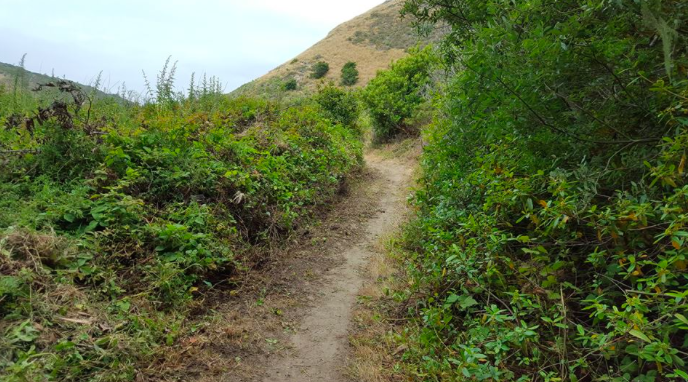 Since 1987, we have worked with California State Parks, the National Forest Service, San Luis Obispo City, San Luis Obispo County and the Land Conservancy of San Luis Obispo County, in designing and building new trails and maintaining existing ones. Staff at the entrance will give you directions on where to meet. Let them know you are there for the workday and you will get the entrance fee waived. We will boat across the lake to Sapwi Camp and will work on the existing Sapwi trail because it was hit pretty hard from the wet winter. There will be brushing, two significant trail adjustments, and several drains to be reshaped. Wear appropriate clothing (long pants, long sleeves, sturdy shoes), and bring a hat, gloves and water. Tools will be provided. Lunch will be provided by the Atascadero Horsemen's Club. Directions: To get to Santa Margarita Lake: From the town of Santa Margarita, go East on Hwy 58. At the intersection of Hwy 58 and Pozo Road, continue straight on Pozo Road for approximately 15 minutes and turn left at Santa Margarita Lake Road. 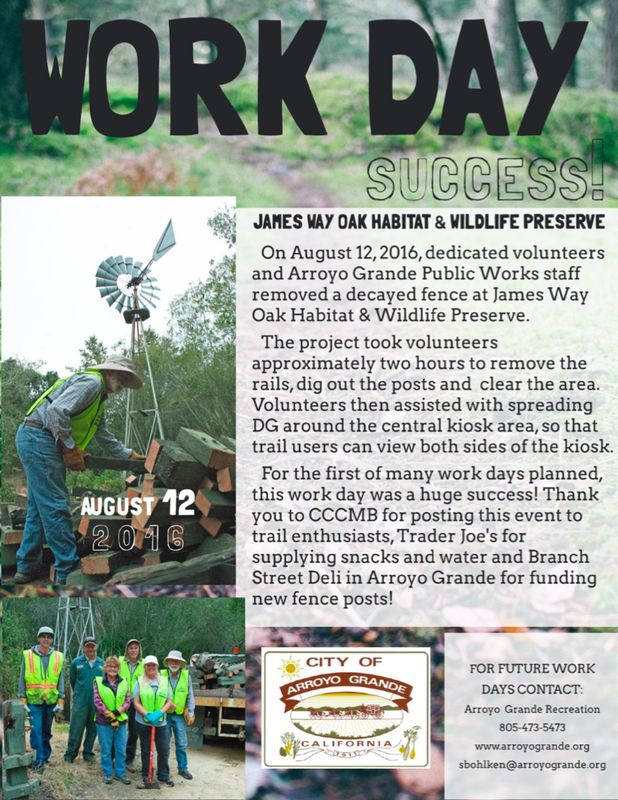 Los Flores Ranch Trail Work Day Completed! Directions: Heading south - Take the 161 exit three miles south of Clark Ave on 101. Note: BBQ lunch after trail work and a raffle for a bike, lights and gift certificates. Also: Volunteers are allowed to bring their bikes and ride LFR after lunch on the work day. 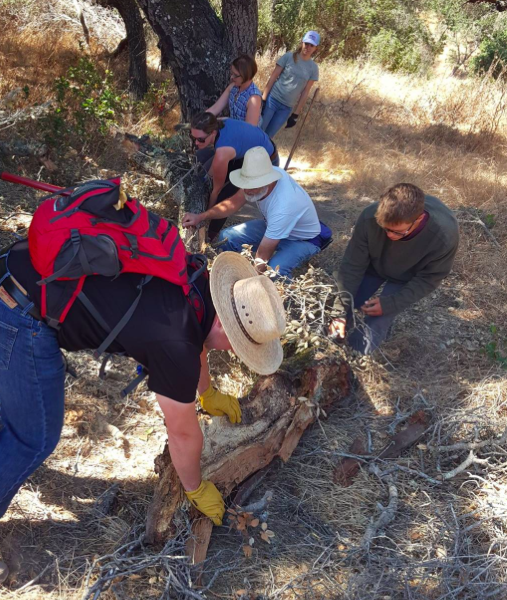 Come join CCCMB and the Atascadero Horsemen's Club to work on the Rinconada Trail on Sunday, April 9 from 9am to 1pm. The focus of our efforts will be treadwork and brushwork. 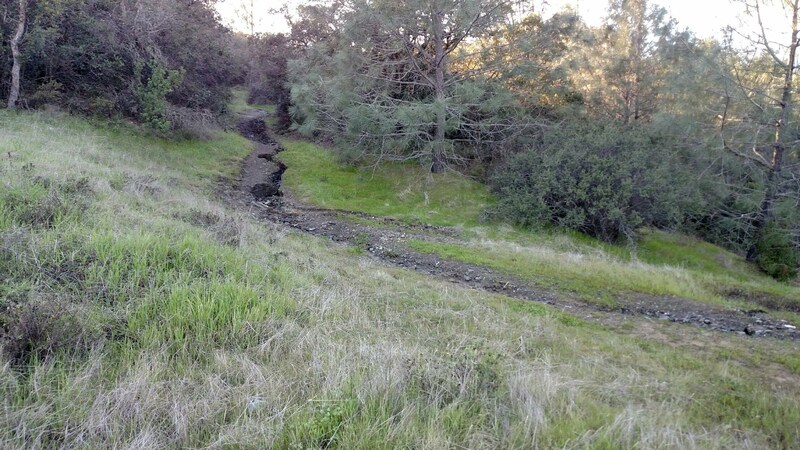 The trail received quite a bit of damage from the rains so it will be great to make improvements. Be prepared for areas with poison oak . Directions: From Santa Margarita, go East on Hwy 58. At the intersection of Hwy 58 and Pozo Road, continue straight on Pozo Road. As you climb the first sizeable grade, you'll see a sign for the Rinconada Trailhead, and turn right into the trailhead. Parking is limited so please carpool if possible. For those driving from SLO or South County, you can meet at 8am at the SLO Vets Hall to drive in together. Lunch provided: by the Atascadero Horsemen's Club. Pismo Preserve Trail Work Day! CCCMB and the Land Conservancy are partnering on a trail workday at the Pismo Preserve and you are invited. Because we are partnering with the Land Conservancy signups are required for this work day and the number of volunteers is limited to 50! When: Saturday April 1st, 9AM to 1PM. Where: Pismo Preserve, Meet at parking lot off Mattie road. While the winter weather has done wonders for our green hills and wildflowers, its created plenty of maintenance issues! We have work for several crews doing tread maintenance and repairs, trail drainage, and dealing with some overgrown vegetation. There’s plenty of opportunity for volunteers with all levels of experience to contribute. So everyone is welcome. Because we are partnering with the Land Conservancy signups are required for this work day and the number of volunteers is limited to 50! INSTRUCTIONS: When signing up, make sure to complete a waiver, and return to the signup page to finish. If you do not return to the signup page, you will not be on the list. Volunteers should come prepared for a moderate hike to worksites. Please bring appropriate trail work clothing, work boots, gloves, hat, sunglasses, sunscreen, and plenty of water. CCCMB will provide tools. Other Campout Details Coming Soon! Trail Work: The focus of this trail work day will be on brushing, trimming, cleaning drains and rebuilding a few short sections of trail due to the latest rain damage. Tools are provided by CCCMB so no need to bring anything except gloves, hat, appropriate shoes/clothing, and water. All are welcome, invite your friends! Trail Work: The focus of this trail work day will be on brushing, trimming, and cleaning drains on Morning Glory. Some work may also be done in the Eucs as well depending on soil dryness. Tools are provided by CCCMB/FASTA so no need to bring anything except gloves, hat, appropriate shoes/clothing, and water. All are welcome, invite your friends! Congratulations goes out to our own Greg Bettencourt for receiving the "Trail Advocacy" leadership award. This IMBA award is given each year to honor outstanding volunteers who are making a significant contribution to the mountain bicycling community nationwide. Greg has received it for the Hawaii / California region, one of 9 throughout the country. He will receive $1,000 for the CCCMB Chapter. More can be read about this award at the IMBA LINK HERE. Scott “Superman Scud” Scudamore was a retired Air Force Captain who exemplified mountain bike volunteerism through his work with MORE. Scud’s specialty was introducing new riders to mountain biking advocacy and the efforts needed from local voices to ensure the sustainability of off-road trail networks to the growing population of outdoor enthusiasts. Due to wet weather over the last few days, we unfortunately need to cancel our scheduled trail workday on Sunday December 11th.. As you all know, rain on the central coast is a blessing, but on trail work days on the Pismo Preserve, it’s not so good. We looked at trail conditions today, and the trails are very muddy - any work and travel on our trails will do more harm than good. The roads will also not be useable, thereby decreasing the safety of our volunteers and staff as well as making the day not as efficient. 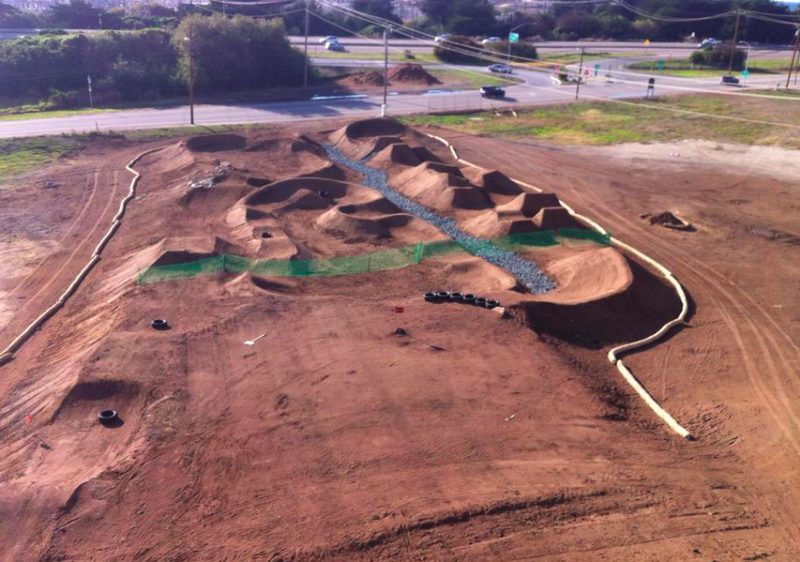 We apologize for the cancelation with such short notice, and thank you for all your hard work on the Pismo Preserve. There was a good turnout for some serious trail construction on Cerro San Luis last Saturday. We continued building the new M Trail extension. Volunteers were precariously perched on a serious side-slope with lots of big and small rocks and plenty of dirt to move. They chipped away and made good progress. We had 15 hardy trail workers and the following folks won gift certificates. If you are interested in helping to build the new M Trail join us Wednesday morning at 8:30 at the end of Hill St. SLO. We are out there every Wednesday morning and work till about noon. the next official CCCMB workday is at the Pismo Preserve on December 11th. Twenty-three volunteers enjoyed a beautiful day of trail work last month at MdO. Work was completed on both Barranca and Hazard Peak trails. Almost 90% of the drains on Barranca were rebuilt in preparation for the upcoming rain! A big thank you goes out to everyone who showed up to take care of a great trail so many of us love to ride, hike, and run. Thanks again to all the volunteers and trail-crew-leaders who help keep our county trails open! Thanks to everyone that came out to the Morro Bay Bike Park Ladies Day! 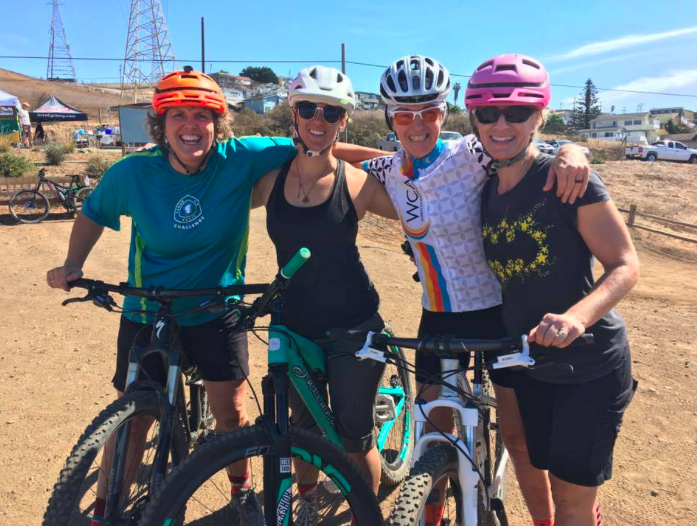 The event successfully raised money for the Morro Bay Bike Park while providing a fun and encouraging atmosphere for women to learn how to ride on the pump track and jumps. Thanks to everyone that came out to our Lopez Lake campout and trail work day last weekend at Lopez Lake! We had about 30 volunteers working on the Duna Vista trail. A couple fallen trees were removed, drains were created, low branches were cut back for equestrians, and lots of brushing was completed. Great job volunteers! A dozen hearty members camped overnight and enjoyed food, games, a night ride and drum circles with smores around the campfire. Join us at our next trail work day on Sunday, October 23rd at Santa Margarita Lake to work on the Sapwi Trail and enjoy a free BBQ after! 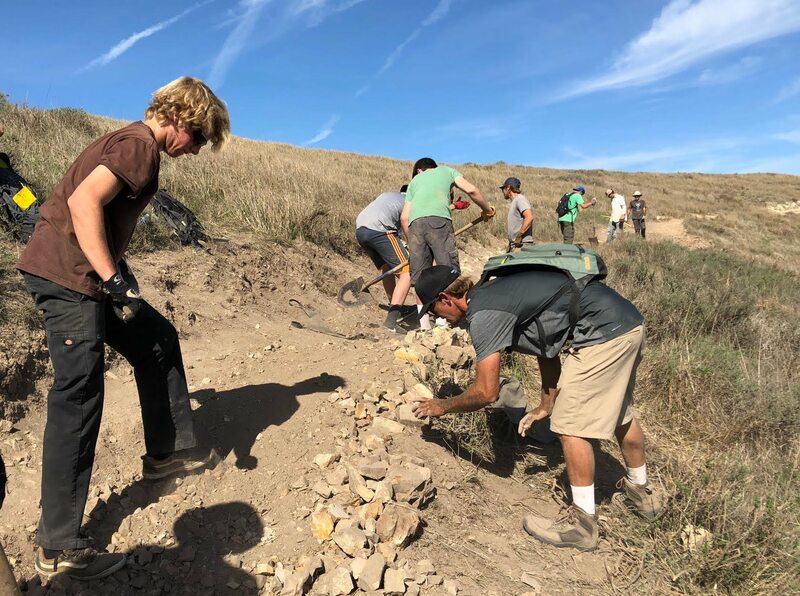 aIf you are an equestrian, trail runner, hiker or mountain biker... or any trail enthusiast, come and join CCCMB for a morning of work on the trail of Montaña de Oro State Park. We will be brushing, and repairing drains in preparation for the upcoming rains (it never hurts to dream!). Meet at the park headquarters ranch house above Spooner's Cove at 9am. Work should be completed by noon or 1pm. Be sure to bring sturdy shoes, gloves, hat, water and long sleeve shirts as you may encounter "avoidable" poison oak. This event is open to the public, so invite your outdoor friends! 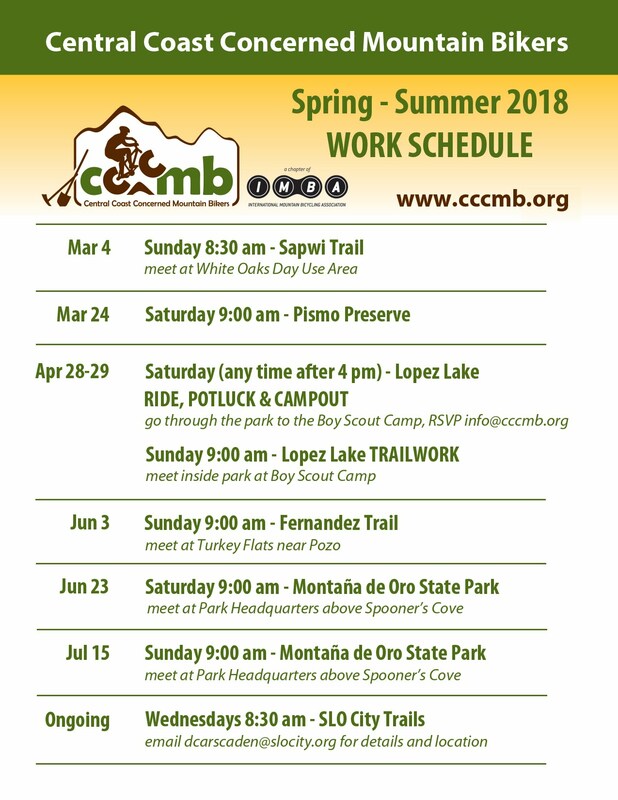 Come out and help CCCMB Members, along with others from the Community, support the Morro Bay Bike Park with the first CCCMB Trail Project of the Fall Season. We will need lots of volunteers to help move some of the rock that runs down the center of the park in order to install a water line with several spigots. This line running up through the center of the park will keep us from having to drag a hose from the one spigot at the bottom all the way to the top to keep the moisture in some of the jumps. San Luis Obispo Bicycle Club Lighthouse Ride is Saturday September 24 and we are counting on CCCMB volunteers to staff a rest stop on Highway 46, three miles east of Highway 1. We will have an SLOBC member captain the stop and need six (6) volunteers to run the stop from 8 am - 11:30 am. - All non-member Volunteers are provided a short sleeve T-Shirt. - All Volunteers are invited to take part in the fully supported Pre-Ride on Sept. 17th. - All Volunteers are invited to attend the Volunteer Banquet at 5:00 PM on Sept. 25th. You can sign up HERE, and please use CCCMB even if you are not a paid member, but just love us to death. We need 4-5 more people to help this next month, please let me know if you can volunteer. Contact Tim Sawchuck at: tim.sawchuck@cccmb.org for more information. In the 2015-2016 trail work season 3CMB volunteers worked 9,072.5 hours. That is equivalent to one standard worker (with 2 weeks off each year), working for over 4 1/2 years. That is a substantial increase over last year when volunteers put in 5,530 hours. Most of this years hours were at the Pismo Preserve which equated to 7,318 hours. 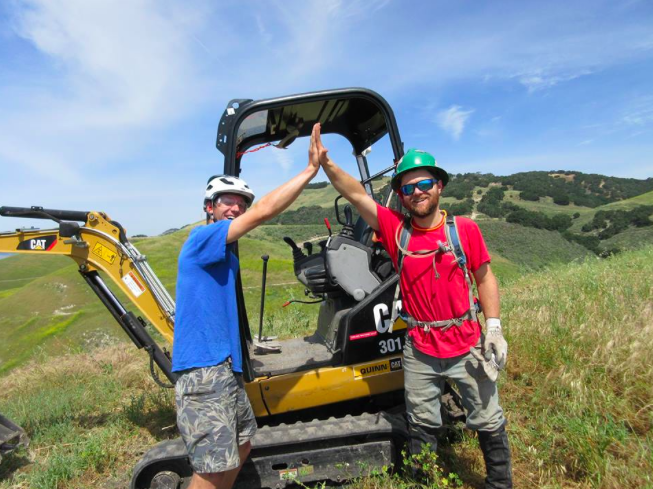 (Pismo Preserve volunteer totals include flagging, machine build and post machine build). Made It To The Top ! We had a big crew today. 20 volunteers braved some warm weather and the 2 mile hike with 1000+ foot climb to the summit. Today was a good day as we made it to the summit. Reaching the conning tower. There is still plenty of work to do on the trail fixing some loose rocks, tread, brushing, etc. It has taken us almost 9 months to build this trail. 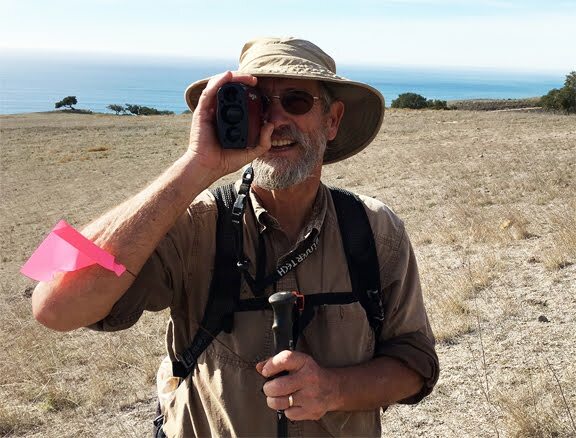 It is a great addition to the SLO Trail hiking system. We will be in Reservoir Canyon a few more weeks fixing portions of the trail. Hope to see some of you there. The next work day is at 8:35 a.m. on Wednesday, July 27th, 2016. So... Why are there so few trail-work days during the middle of summer? It seems odd that we have longer days and more time to devote to trail-work during the summer, but very little is scheduled. Well, it mostly has to do with the lack of rain. Moving soil around for new trails or trail repair does not work this time of year because the soil does not stay together where it is put. The berms turn into dust and the risers just flatten back out. So... until it rains again, all we can do is trim brush and stack rocks! A big thanks to all those who helped out yesterday (Saturday 6/11) at MdO, clearing brush on the Manzanita Trail. You made it possible to ride out there, once again, without being inundated by poison oak. 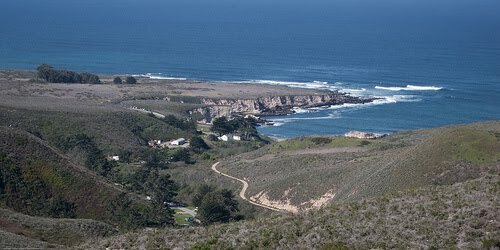 WHAT: We invite you to come out to Montana de Oro State Park this Saturday at 9:00 am. There is much work to be done maintaining the many trail sections, clearing trail drains, heightening grade reversals, clearing brush (top priority), reinforcing "blown-out" corners, and just plain getting the trails ready for the busy summer season. Come out and work along with other trail enthusiasts in this good community of people who enjoy multi-use trails. Work is usually complete by noon or 1pm. WHERE: Meet at the ranch house at Spooner's Cove in Montana de Oro at 9:00am. We will divide into groups and hike to the various projects around the park. BRING: Bring the usual, water, sturdy shoes, gloves, hat, and long-sleeve appropriate attire, CCCMB will provide all tools needed. WHAT: The Bike Park recently got hit with lots of graffiti and this is a chance to get things cleaned back up, along with maintenance on some of the runs and jumps. BRING: Water, snack food, your favorite work tool (some will be provided) and a passion for work and fun with others in your community. WHAT: We invite you to come out to Santa Margarita Lake and help us extend the Sapwi trail this Saturday at 8:30 am. There is much work to be done adding new trail sections, clearing trail drains, heightening grade reversals, reinforcing water crossings with rock, installing culverts, and just plain good solid trail work with a good community of people who enjoy the outdoors. 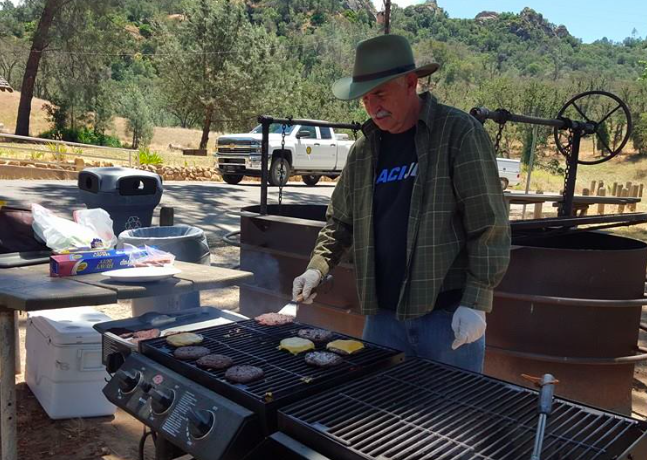 FOOD: Post work BBQ will be put on by the Atascadero Horseman Association. WHERE: Meet at White Oak picnic area at 8:30am. We will hike across the empty lake to the work site. Let the entrance gate ranger know you are there for volunteer trail work and you will not be charged an entrance fee. BRING: Bring the usual, water, sturdy shoes, gloves, hat, appropriate attire, we will provide tools and direction. 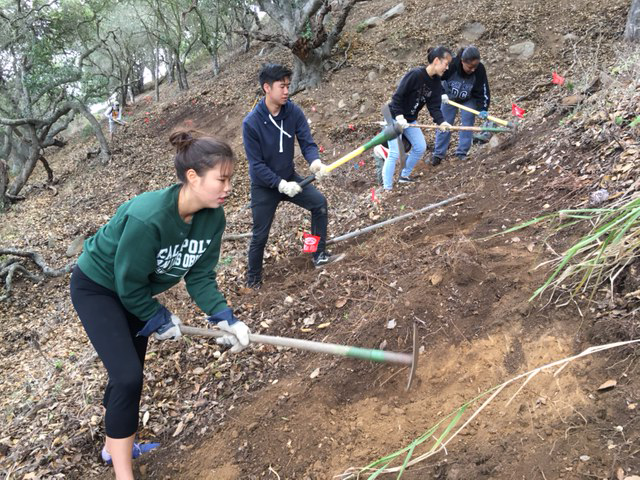 Do you enjoy trails and want to help CCCMB without wading through poison oak or lifting a shovel? We are in need of two volunteer positions: E-Newsletter Editor, Insurance Consultant. Content generated primarily from CCCMB Directors--not you! 3. making sure it all comes together and is distributed at the agreed upon date. Prefer someone who can make a two-year commitment. Both positions require only periodic time commitments that can be coordinated around each volunteer's schedule. If you'd like to help, please email volunteer@cccmb.org. The Pismo Preserve Trail Project, which began in January, was completed today (April 7th). More than 230 dedicated volunteers worked 2 shifts a day, 5 days a week to complete the build. Most crews averaged 15 volunteers, but ran as high as 25 people. Two TrailWerks days were also dedicated to the project which drew 60+ volunteers during one Saturday each in February and March. Dylan Theobold, the Land Conservancy Project Lead, commented "Today was a big day for the Central Coast. 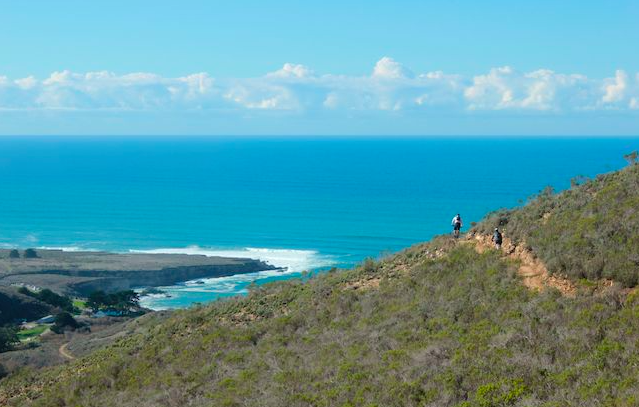 11 miles of exquisite trail built in 3 months , no injuries, new friendships, good times, hard work, sweat, poison oak, convicts, dirt, and some pretty nice views of the Pacific ocean." Today's Trail Crew shared a small lunch celebration with pizza delivered to the job sight and a farewell toast to the last group of volunteers. A light crew will maintain the trails once a week during the summer until the parking lot and restrooms are completed in August. Until then, the Pismo Preserve will not be open to the public. CCCMB will be working on the Morning Glory trail in the City of SLO Open Space section doing some drain rebuilding and brushing. Everyone is welcome! Meet at the FASTA Skill Park kiosk in the Stenner Spring Eucs Grove at 9:30 am. Bike or hike in from Stenner Creek Road up Poly Canyon. Work from 9:30 am until 12:30 pm. If you have loppers that you can carry in, please bring them. Please wear sturdy clothing, long sleeves, long pants, gloves, hat, boots, and bring some water and snacks. This project has been in progress over two months, and already the volunteers have completed just over 9 miles of the 11 miles of trail for the project. These 200+ volunteers have put in over 4,500 hours of work so far. Pictures and progress can be seen AT THIS LINK. 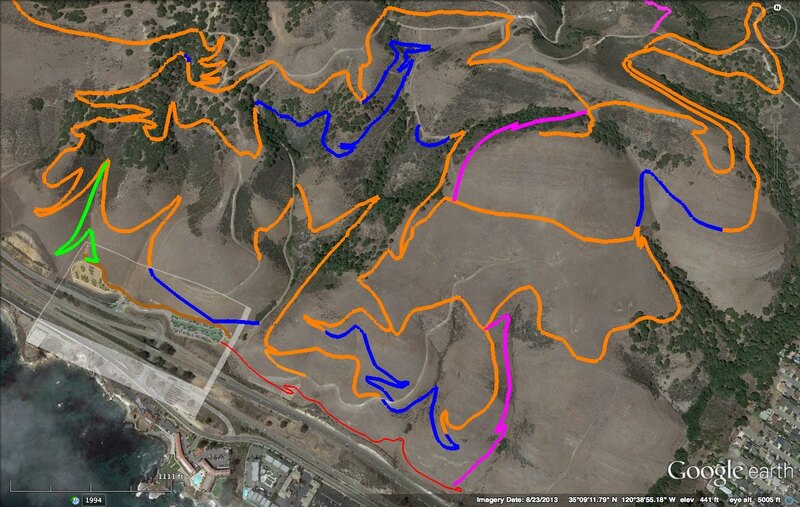 Below is a map of the Pismo Preserve showing completed trails in ORANGE. 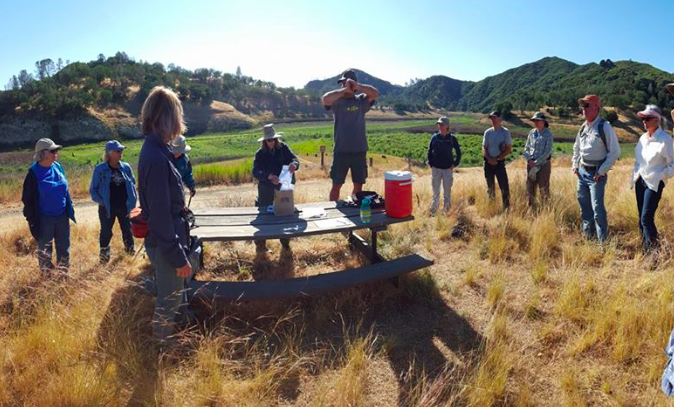 The enthusiastic group was given a safety briefing (pic above), while while they munched on a free breakfast provided by the many sponsors listed below, then the drawing took place for the 2015 Specialized Camber donated by Pedal Power of Santa Maria. During registration each of the 98 participants won raffle prizes such as gift cards, sweatshirts, bike pumps and socks. CCCMB would like to thank all of the hikers, bikers, trail runners and equestrians who came out to help keep the trails of MdO in top shape. John Cutter and Bill Waycott represented CCCMB on the Dave Congalton Show on November 18th. There is a lot of information about trails in our county including trail plans for the Pismo Preserve. Listen to the entire interview on KVEC HERE. Below is a recent picture from the Sapwi Trail Work day. WHAT: We invite you to come out to Santa Margarita Lake and help us extend the Sapwi trail this Saturday at 9:00 am. There is much work to be done preparing for the rains that will fall, such as cleaning drains, heightening grade reversals, reinforcing water crossings with rock, installing culverts, and just plain having a good time. FOOD: Post work snacks and drinks will be served. WHERE: Because the lake is so low we will meet at Vaca Flats picnic area, farther east than White Oak, and walk around the mud puddle to the other side. We invite you to come out to Santa Margarita Lake and help us extend the Sapwi trail this Saturday at 9:00 am. There is much work to be done preparing for the rains that will fall. We will clean drains, heighten grade reversals, reinforce water crossings with rock, install culvert, and have a good old time. Post work snacks and drinks will be served. Because the lake is so low we will meet at Vaca Flats picnic area, farther east than White Oak, and walk around the mud puddle to the other side. Bring the usual, water, sturdy shoes, gloves, hat, appropriate attire, we will provide tools and direction. After years of negotiations, permits, agreements, MOUs, designs, planning and City Council meetings, day 1 of construction has begun at the Morro Bay Bike Park. Bonnie Johnson (pictured), along with many others have put in hundreds of hours in preparation of this day. If you get a chance, drop by the bike park site at the corner of Radcliffe St. and Little Morro Creek Rd. 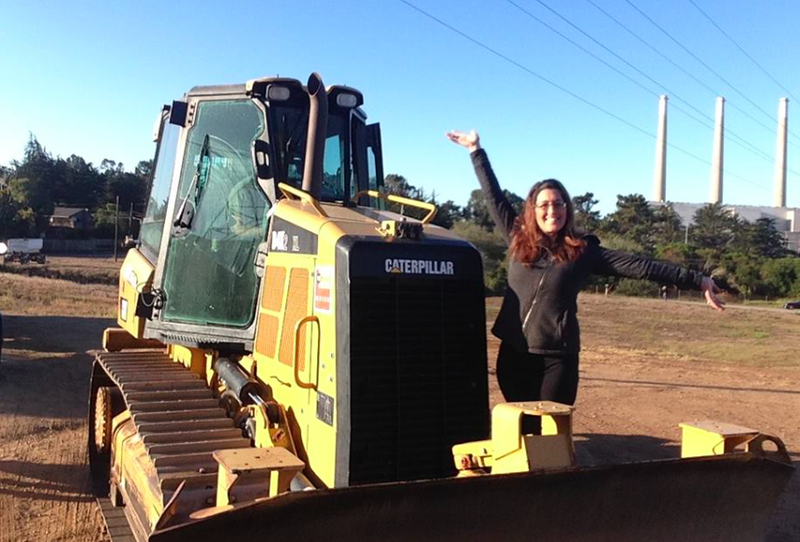 in Morro Bay to watch the bull dozer in action. About 25 volunteers showed up last Sunday to join CCCMB for the first trail work day of the 2015/16 season. 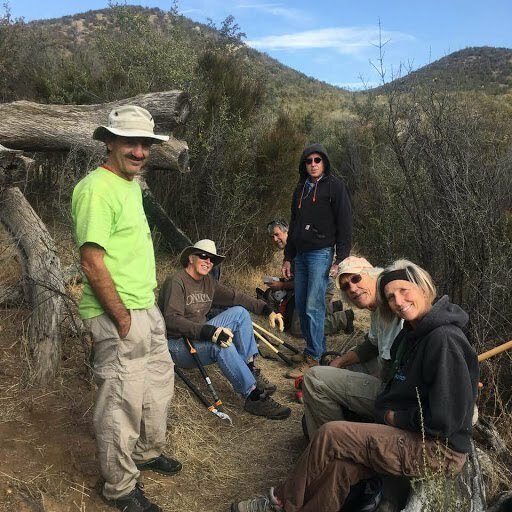 They met at the Park Headquarters above Spooner's Cove at 9am and worked on clearing drains along Oats Peak and Valencia Peak trails in anticipation of the upcoming rain season. Trail maintenance also included installing a new "weather-proof" bell box at the top of Hazard Peak. The new bell box replaced an older model that served many years but finally succumbed to the elements. The new style box uses a magnetic plate to hold the bells for easier picking. With the bells more visible, it is hoped that more riders will be encouraged to use them making the trails safer to all. The Wednesday Crew numbered about a dozen and tackled several projects on the lower part of Bishops Peak. One group installed a "hinged center pole" on the trail just above the Highland Drive parking area. This center pole will help keep bikes and motorcycles out, while still allowing emergency crews to push a one-wheel gurney up the trail for rescues. The other group installed a cattle guard part way up the trail to prevent cattle from wandering up the trail toward the peak (see picture above). After a couple hours, the two groups were reunited to re-route a short trail that goes from the "lake", and I use that term loosely, to a climbing rock called "The Boulder in the Woods". They were all done by noon on a very productive morning! Thanks for all the volunteers that put in some hard work! From today's Wednesday Trail Crew, we had 15 volunteers, 7 hikers, 2 trail runners, 2 bikers and 4 rangers braving the heat to work on the Ocean View Trail in Irish Hills. I am happy to report we have reached the summit of the trail and it is now open. We will be working on the Ocean View Trail next week to install some signage, clean up a few sections, improve the final destination and hall out many of the tools used to construct the trail. The City of SLO encourages people to stop at the view point. Trespassing on adjacent lands is disrespectful to private land owners and could jeopardize future opportunities that may occur in the Irish Hills. Come out Wednesday, 9/16 if you can to help the City finalize this trail and prepare for the next project. Meet in the Home Depot Parking Lot to the left of the Garden Center at 8:30 a.m.
Come out on Wednesday mornings at 8:30 a.m. to help finish up this new multi-use trail. Meet at the Home Depot Parking Lot left of the Garden Center for a ride up the hill. Then, it is a 1.6 mile hike to the work site. Bring water, snacks, and hiking boots/shoes. Tools and good company will be provided. This is a request for YOU to volunteer at SLOBC's annual Lighthouse Century fund raiser on Saturday, September 26th. 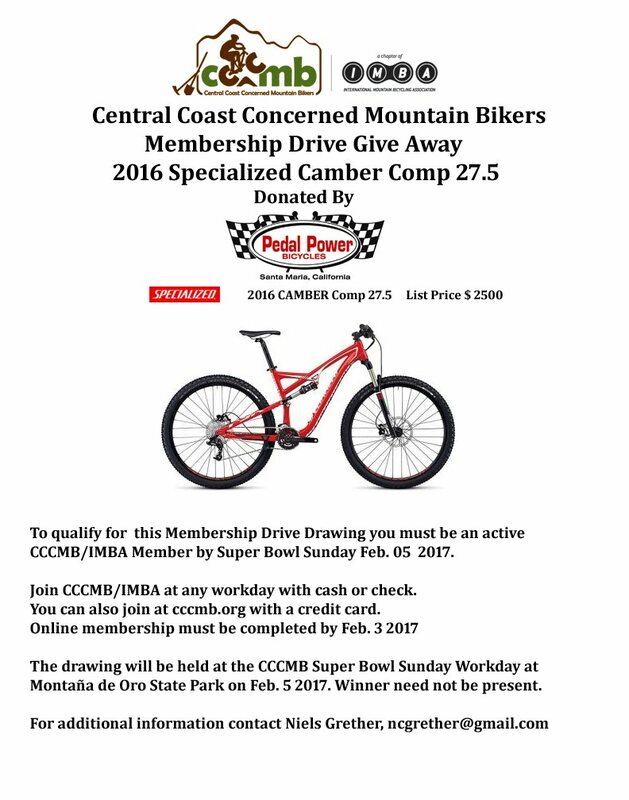 SLO Bicycle Club has been a generous supporter of CCCMB of many years. VOLUNTEERS FOR THE HWY 46 REST STOP. As of now, we have a full crew for the Highway 46 Rest Stop, but if anyone wants to volunteer for other fun jobs at a great event, they can contact Will Benedict at williambenedict@me.com. All century volunteers receive a very cool Ride T-Shirt. You are invited to the Volunteer Brunch BBQ on Sunday afternoon, September 27th . And if your job does not fall on the day of the event, YOU CAN RIDE THE EVENT FOR FREE. Your reward choices are made when you volunteer. Flow Trail Video HERE - Experience the entire trail from top to bottom! After months of hard work by a 20+ group of volunteers named the "Wednesday Trail Workers", the new Stenner Flow Trail is now open for business. The opening ceremony took place last Wednesday as workers were putting the final touches on this new unique mountain bike trail. This new trail is considered a one-way downhill bike-only trail that starts at the bottom end of "The Eucs", below the Shooters Trail (see the West Cuesta Ridge Trail Map Here). 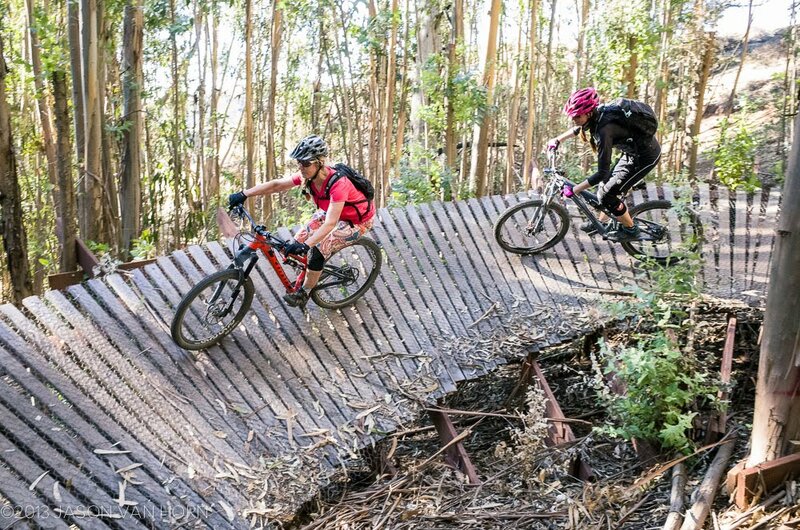 There are two ways to reach the Flow Trail, the first of which is to ride from the top of Cuesta Grade, down the Shooters Trail, then through the Yewks. For those coming from San Luis Obispo, ride or drive up Stenner Canyon Rd. to the parking area, then continue all the way up the Elevator Trail to the Eucss. From the bottom of The Eucs, the Flow Trail takes off to the left, and at the beginning shares parts of the two-way Elevator Trail. After branching off a third of the way down, it becomes purely a one-way, downhill "flow" trail, with berms, and other features for the intermediate to advanced rider. The trail is the brainchild of Neils Grether, an avid mountain biker and member of CCCMB. 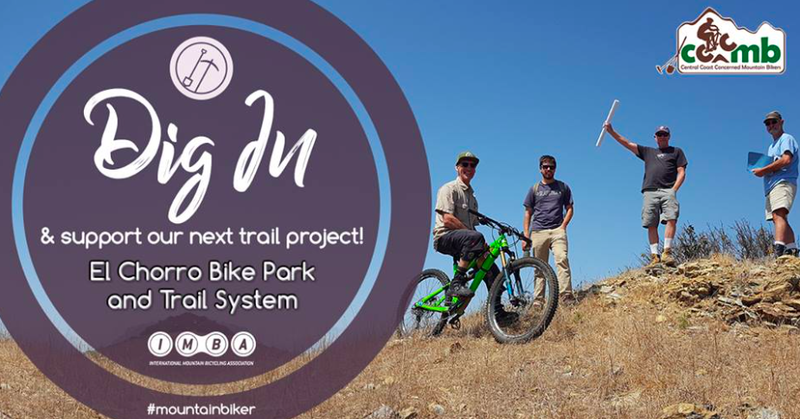 During his senior year at Cal Poly, Neils saw the need for this type of trail in our county and decided to make it his senior project. The full project included design, obtaining all the necessary permits, layout, flagging, and overseeing construction. The entire project took over a year to complete with lots of help and support along the way. Video of complete trail coming soon! The Wednesday morning trail workers have been busy planning and building a new trail below the Eucs running parallel to the Elevator Trail. This new trail, designed by Neils Grether as a Poly senior project is being built by CCCMB under his guidance. It is a bike oriented trail with lots of flow and berms and may be named the Stenner Flow Trail, although that is still up for debate. It crisscrosses the old road that used to be the downhill bike route coming off of Shooters Trail, before Elevator was built. There is still a lot to be done and anyone who wants to join the Wednesday morning work group should meet at the last gate up Stenner Creek Road at 8:30am on Wednesday mornings.